After gathering several of my polymer clay color recipes (you can see them all here), one of my readers asked me how I kept those color recipes. So today, I thought I would take a moment and show you my system for keeping my colors. Please know that there are literally dozens of ways you can do this. I have chosen to organize my colors this way because it is the most helpful and useful to me. 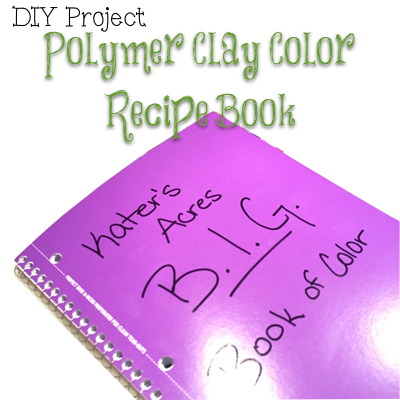 Feel free to use some, parts, or all of these ideas to make your own polymer clay color recipe book. For recipes that I make often (Parker for example) I keep recipe cards handy, directly in front of me at my workstation. You can get your own free printable to make your own recipe cards here. About a year ago I had made so many color recipes I needed a place to put them, along with notes on how they were made, color palette ideas, etc. The other reason that I started this notebook was because of the “Sparkling Berry” color I made & posted here on the site. I made this color as specified in the recipe, however, I was NOT able to ever duplicate it. This bothered me … why? Did the pigment in the clay brand change? Perhaps. I’m still working to duplicate it (it’s on the “to-do list” but I haven’t gotten there yet) and when I recreate it, I will post the results for you. So now I take samples & swatches of even “from the pack” clays to use as a basis of comparison. Post-It Note Minis – These will operate as “tabs” for your pages. White School Glue – This is to glue your sample swatches to your notebook or notecards. After you’ve made your recipe, make a “swatch” of that color and bake it how you would normally bake clay in your oven. For example if your clays always bake at 275 for 45 minutes, covered in foil, then bake these for the same amount of time. This way you will be able to have the same “circumstances” that you normally would have, allowing you to see things like color shift. Make sure you keep some of the UNBAKED color so that you can compare the before baking & after baking sample (you can see examples of this here on the 2015 polymer clay review of Polyform’s new line). Divide your notebook into sections. You can use any section names you’d like, but my sections include both a color (green) and an effects category for most colors (green effects). This is so that if I made a olive green glitter clay, I can keep it separated from my plain colors. Write the section names at the top of the page. Again feel free to do this however you’d like. Because my primary clay is Premo!, I have separate pages for “Sculpey” and “Fimo” and “Pardo” clays but do not include those recipes in the main color recipe section of my notebook. Mark the section pages with a mini post-it note to act as a “tab” for that page. Once you have your color swatches (see above), place them on the coordinating pages using traditional white glue. Make sure to include notes on your color that you noticed or that you would like to do differently. Include things like overall softness, color shift, etc. You can see my rating system for some of these things here.